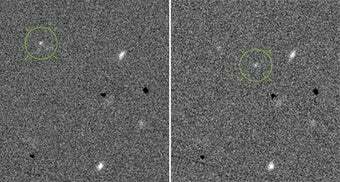 A new telescope, equipped with a 1.8 billion pixel camera, has discovered its first potentially dangerous asteroid. The rock is a lot smaller than any other asteroid we've detected before, and that's great news for our still-developing asteroid defense system. The actual chances of asteroid 2010 ST3 actually hitting Earth are very, very small - we won't be in the danger zone until 2098, and even then we're only a very tiny speck in its possible range of locations. But at just 50 meters across, it exists in a worrying sweet spot: too small for conventional telescopes to spot, but more than big enough to do major regional damage if it hit Earth. That's why the new PANSTARRS - short for Panoramic Survey Telescope & Rapid Response System - is so important. Its incredibly powerful camera allows astronomers to spot tiny asteroids like these at much greater distances than ever before. We now have 88 years to figure out 2010 ST3's precise path and, if it's a threat to Earth, find a way to deflect it. For more on this story, check out Bad Astronomy.